Until 21st September 2014, there is an exhibition at The Lady Lever Art Gallery in Port Sunlight. It is called ‘Rosetti’s Obsession:Images of Jane Morris. Jane Morris, with her unusual features, personally I would not say classically beautiful, just STUNNING,soon became the face of the Pre-Raphaelite Brotherhood,one of whose founding members was Dante Gabriel Rossetti. She was from a very poor family, was’discovered’ after a theatre trip by Rossetti, met and married William Morris,he of the English Arts and Crafts fame, and had two daughters. She educated herself,spoke various languages,maintained affairs-and all while posing for some of the most beautiful paintings to be associated with the PRB. She was a very busy woman! The exhibition combines pencil sketches and pastel drawings, Rossetti’s need to capture her and contain her image,whether in repose or in the large works such as ‘La Donna della Fiamma’1877 is consuming. There are lovely photographs of Jane in the poses that she was painted or drawn in. Victorian photographs always seem to surprise me, a true likeness always looks harsh and just a bit creepy,great to see any way. But for me, seeing ‘Proserpine’ 1874, was the highlight of the exhibition! It’s colour and detail need to be appreciated, and I felt very lucky to have seen it close up. The exhibition shows the woman behind those famous paintings,from young muse,to mother ( a letter to her newly divorced and disgraced daughter was touching) and to older, infirm lady. I began to think of it more as a record of Jane’s life story rather than Rossetti’s obsession. It is an intimate exhibition of a muses relationship not only with her artist but the developments from it. Here is a link for more information,please go see it, IT’S FREE (a donation would be nice though!) And coffee and cake in the cafe makes for a pleasant ending to your visit. 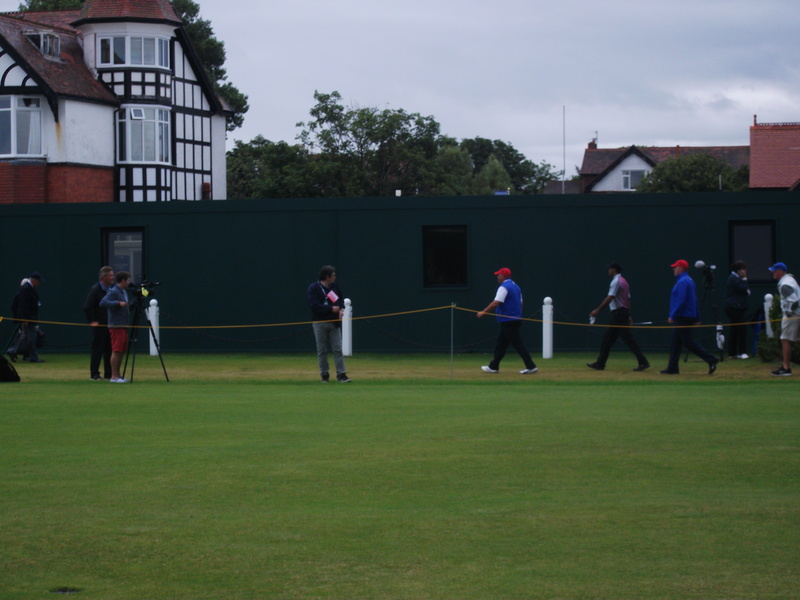 I had bought tickets for the practice days of The Open, staged this year at Royal Liverpool,Hoylake; not too far from where we live and in a very pleasant part of the world. I agreed to go with my chap as I ‘quite liked that nice chap Tom Watson’ and I might be able to sit off somewhere and just eat ice cream while looking out for low flying golf balls. When we arrived there at sparrows fart in the morning, the town of Hoylake was all awake and prepared. I counted at least two stuffed tigers strapped to parked cars.There were guides waiting to help you get to where you were going and all with a cup of tea and a cake. Well done Hoylakians,you were lovely. Programmes bought, we were stopped by a nice gentleman waving golden tickets. Unfortunatly it was not Willy Wonka, but a chap asking us would we like a ‘free lunch’ I immediatly kept on walking.’Don’t be so cynical.’ he said. ‘I was born cynical ‘ I replied in a cynical I’m not giving you bank details,sitting through a presentation kind of way. Jimbo polity listened and took two golden envelopes from him. ‘Sucker!’ I thought. We began our walk around the course, and it looked amazing. Very lush,very green and not a spot of litter thanks to the polite youngsters who patrolled looking for escaped rubbish. 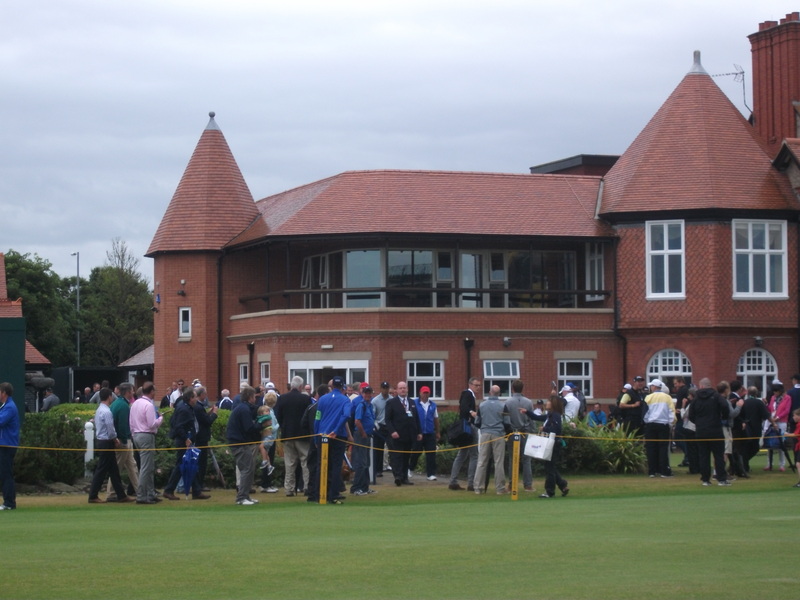 We headed toward the club house, where a lot of people milled,putted,chatted and looked harried. We watched various golfers leaving to go to practice. There were a lot of (male) groupies who would just rap off the names of who was waiting to go out. I went to put my coffee cup in the bin but was quickly shouted at to ‘Come Back!’. That lovely Tom Watson had strolled across to sign flags,giant golf balls and programmes. At this point I would have liked to get a photo but I was pushed aside buy nervous golf fans,bursting with joy at seeing a hero. It was quite sweet actually. Everyone was very polite,yet there was a rush at seeing a favorite player. ‘Tiger! Tiger!’ If you squint ,he’s between the two red hatted security! After much walking,getting soaked and more walking we went for lunch. Jimbo with golden tickets waving forced me into The Champion’s Club. The tickets had been given out so the waiting on staff could have some practice with real people before the actual start of The Open. At each table was a bucket of free wine and beer, the food-excellent- was free and the staff were fantastic. We left after and hour stuffed and relaxed. Much to my chagrin and Jimbo’s laughing there is such a thing as a free lunch. 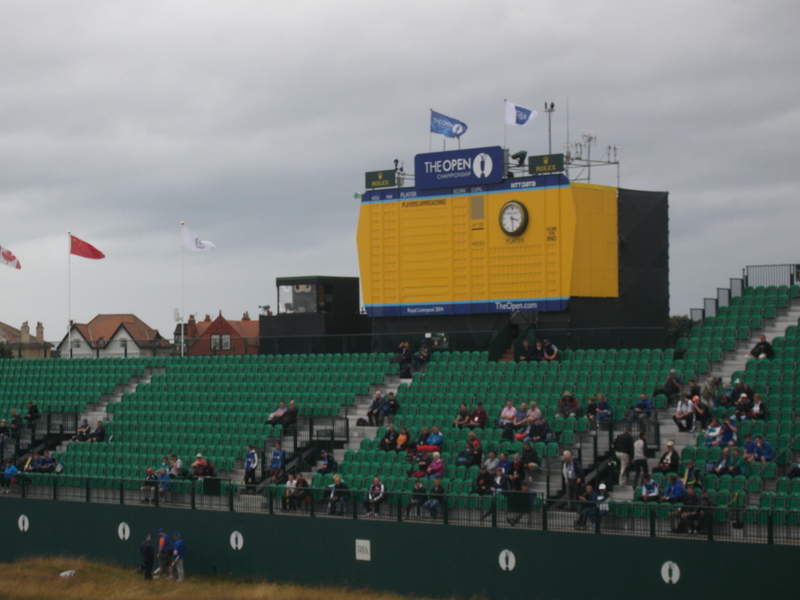 We carried on following various players on the course and rested in the new 18th Hole stand. It looked impressive, even in the rain. 18th Hole stand. Like an ampitheatre! And so, it was coming toward the end of my day as a sport enthusiast. We ambled toward the gates,looking wistfully at the sand dunes and Hilbre Island that this course overlooks. I was surprised at how I became caught up by the atmosphere,and the genuine happiness among the other attendees. It was a great day. 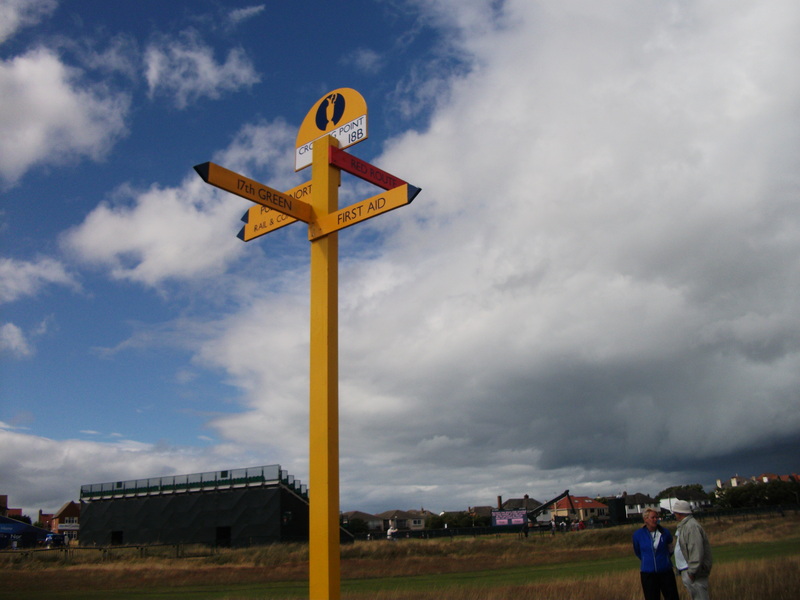 The Open 2014. Royal Liverpool,Hoylake. I’m going to a funeral today. A good friend died last week,her daughter left a message on our answerphone. She had been taken into hospital through the night and had died not long after. Her daughter is a lot older than me. Her granddaughters are, I think, about my age. My friend was 94, yes that old. Whenever I tell anyone, they look at me like I am an idiot. ‘What? 94!’ they nearly always say. It’s only recently that I have come to realize that people have strange ideas about the age restrictions of friendship, (I’m not even going near being friends with those ‘too young’). Since when was having a friend older than yourself something to be repulsed by? What is the upper age limit on friendship? J*** was funny,interesting,considerate,listened and listened to,loved politics and still liked a drink and the occasional cigarette. We hit it off immediately!Before she died she was about to go on holiday for a spa break. I won’t blather on about how older people are treated especially in the UK.It’s abysmal. My mother said one of the worst things was being patronized; talked down to like you had never been a child, never worked, seen poverty, raised children or been ‘young'(J*** told me about things that went on when she was young,Free Love did not start in the 60’s!). I’ll probably cry today and feel sad. Sad that I won’t have our chats (gossip) and that I won’t see her having a smoke in the garden or coming home from work,she volunteered at a local hospital until last year. But I’m so glad I knew her;she lived life full on and that’s a lesson I will take with me from her, from my friend.